Small con fun at the Gammacon 2015, Australia. It smells good here.. I love a small con..
Once, I attended a huge event (The Sydney Royal Easter Show) where a woman straight up rolled over my stationary foot with her roller bag, staring at me with dead eyes, then rolled on. Crowds for me can be slightly panic inducing, so anywhere that I can enjoy my geeky passions without becoming a little dead inside by the end of the day, is a good place to be. Enter Gammacon in Australia! 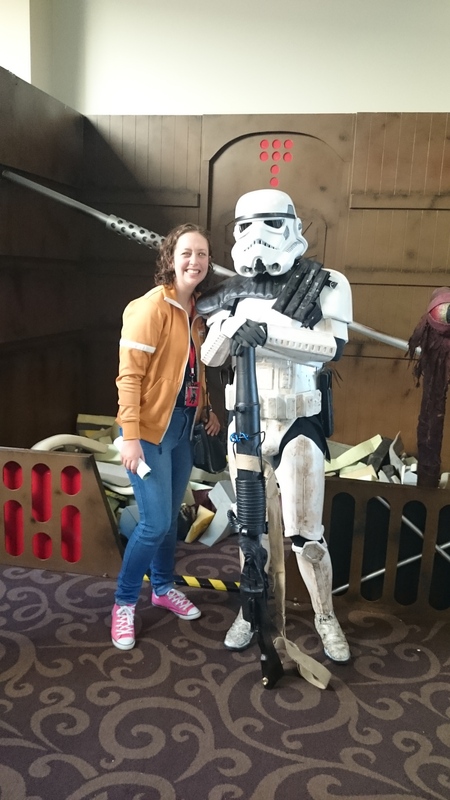 Canberra’s short-lived but extra awesome pop culture convention. I volunteered during the 2nd Gammacon in 2014, and this year a humble attendee. One of my favourite quotes from special guest Gus ‘Goose’ Ronald (from Good Game, ABC TV) was that Gammacon was “a lovely smelling convention.” Maybe that sounds a little odd, but con-smell is the worst. Been to San Diego Comic-con on a Sunday afternoon? You know what I’m talking about. A lovely smelling convention it may have been, but also just nice. I don’t mean ‘nice’ in a disparaging way, it was a genuinely nice place to be. The special guests were incredibly approachable, as were the artists/vendors and the local game devs who had an area for their demos. Also, there was an awesome gaming zone with both current gen and retro consoles, with some seriously competitive Dance Dance Revolution going on. Here are some pics and highlights..
A favourite moment of the day at Gammacon, I unfortunately didn’t get a picture of. I was washing my hands in the bathroom and I came across a girl painting a third eye on her forehead. I asked her if that had anything to do with Welcome to Night Vale and she said yes, and I was the first person to recognize that. We had a mutual fangirl moment! Non-geeky people often ask me what the appeal of a convention is, and for me it is moments like these. Those little serendipitous moments where you realize that weird little podcast that you listen to at night is not just your obsession, but someone else’s too. It’s where the things that make you strange in your everyday life make you belong somewhere, even if it’s only for a weekend. And, if it smells good that is a bonus.